From the 1950’s version of futuristic living to the 1960’s counter-culture revolution to Marin County’s 1970’s hot-tub escapades, Geodesic Domes have been a part of the San Francisco Bay Area experience. For many Marin County residents, the term Geodesic Dome evokes memories of "Dome Guru" Lloyd Khan’s hand-cut redwood shingled Bolinas home and hippy communes with psychedelically painted Geodesic Domes in the North Bay. Some recall hearing of Grace Slick’s Marin County Geodesic Dome, where she both meditated and harmonized with the Jefferson Airplane in the 1960’s. However, when a contractor thinks of a dome, she thinks of a problematic construction project, of doors and windows that do not fit; The frustration of attempting to adapt angular building materials to a shape that doesn’t conform to traditional construction. For a roofing contractor, shingling a Geodesic Dome can be equally challenging, requiring specialized roofing techniques with expert attention to details. The Geodesic Dome was a prefab housing trend patented by R. Buckminster Fuller in 1954 as a solution to the post-World War II housing shortage. Constructed of intersecting triangles, domes were inexpensive and easy to assemble. Built from kits illustrated in Whole Earth Catalog and Mother Jones Magazine, Geodesic Domes appeared in Marin and Sonoma Counties in the 1960’s. The first Marin County Geodesic Dome was built as an artist’s studio in Mill Valley by Charles McKee who headed the ceramics department at San Francisco State College. With the help of a friend, McKee built the 26-foot dome in only a few hours. The counter-culture generation embraced the “dome boom,” as living in the round was a pure alternative to the “square” box houses of their parents. From Pt. Reyes to Guerneville, Geodesic domes dotted the Northbay landscape. Celebrating a back-to-nature attitude with homegrown food and mortgage-free living, the handmade Geodesic Dome was an outward symbol of the hippy culture’s alternative lifestyle. The interior openness of the dome celebrated communal living, without boundaries or barriers. At the intersecting point between hippies and yuppies, surprisingly Geodesic Domes endured. As hippies morphed towards 1980’s-era yuppies, most domes were abandoned or demolished. Yet, in Marin County where peacock-feathered hot tubs became de rigueur for Marinites, plastic covered Geodesic Domes provided warmth on cool nights when the fog rolled in. Over three decades, Wedge Roofing’s work on Geodesic Domes has spanned these unique milestones of San Francisco Bay Area history. From the 1970’s, when Ralph Wedge and his crew installed hand-cut cedar wood shakes to a Geodesic Dome high above the Renaissance Fair in Blackpoint. 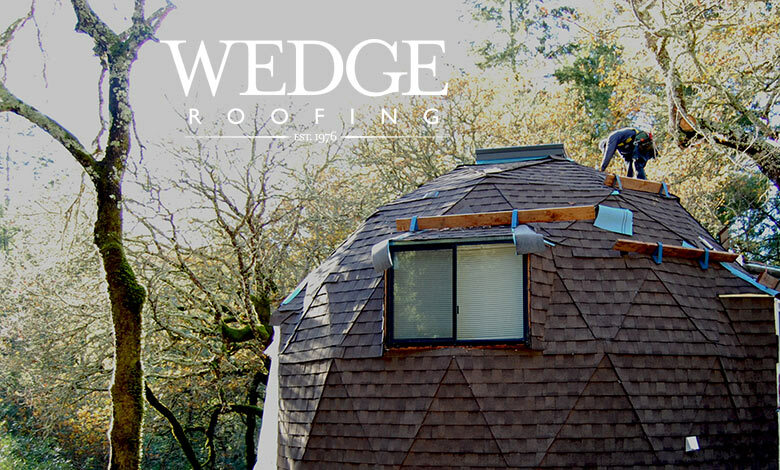 To recently, in Glen Ellen, where the Wedge Roofing shingle crew installed hand-cut composition shingles to a Geodesic Dome as part of a major remodel of the three-million-dollar residence. Wedge Roofing has been part of our collective Bay Area Geodesic Dome history. The roof replacement on my rental was completed on time and on budget with minimal disruption to our tenants. The workmanship is outstanding and the finished roof is perfect. In the future, I will call Wedge Roofing for all my roofing needs."